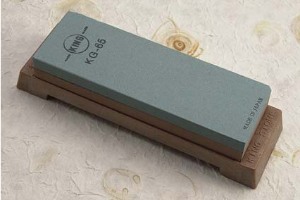 Size: 7.3" x 2.5" x 1"
Description: This King combination clay matrix waterstone provides coarse and medium-coarse grits. The #220 grit side is "green carbide" for rapid cutting. The #800 grit side is made from aluminum oxide and removes scratches left by the #220 grit stone. A Finish Stone will be required for a razor sharp edge. This stone is mounted on an impact resistant plastic base.